Day 28 of the 30 Paintings in 30 Days challenge. I chose to tackle a painting that I thought would be a lot of work and time. But, after I got going on it, I found my process of painting the chess pieces and moved along fairly quickly. The chess set is a huge human size set from a photo I took on vacation. So, I have shrunk it down to work with the chickadees. I decided to try Quinacridone Burnt Orange for the main color in the brown pieces and I loved working with it. It is a very vibrant color and I didn't have to do many layers because of that. I chose to have the background be a bright blue and some of the blue reflects into the lighter areas of the chess pieces. The chickadee that is flying adds a bit of motion to an otherwise static scene. 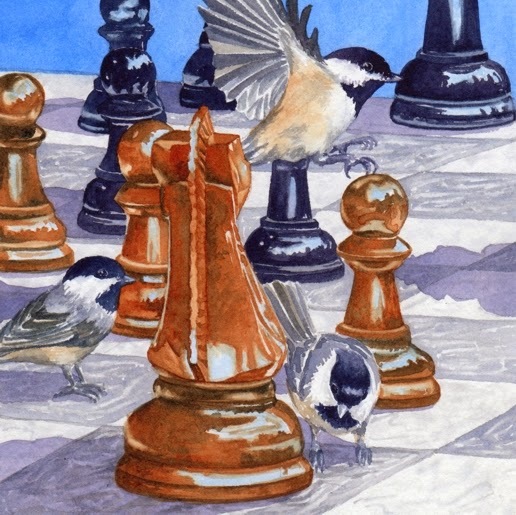 "Chickadees, Chess, Checkmate" is a 6"x6" watercolor and is available on Daily Paintworks for $150 (framed). Click here to purchase. So fun, and what a Title!